When the pineapple starts to soften add the brown sugar and cook till some of the liquid has evaporated. Bake according to the cake mix directions. Make sure your knife is clean when you test the cake for doneness. 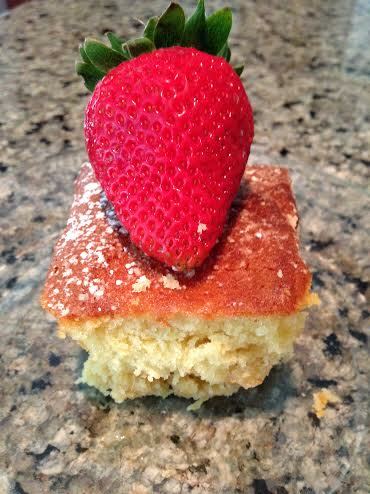 Serve with a cherry or strawberry on top. Whipped cream or ice cream would be a nice touch. Good cake to take to a BBQ. This is a recipe that I forget about and when I make them I love them. Melt the butter in a saute pan and cook the onions till soft. 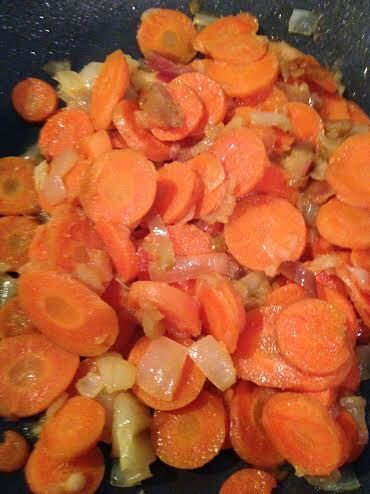 Add the carrots and apples and cook till semisoft. Add the brown sugar and cook till all is incorporated. The raisins or pineapple can be added now but I usually don’t add them. 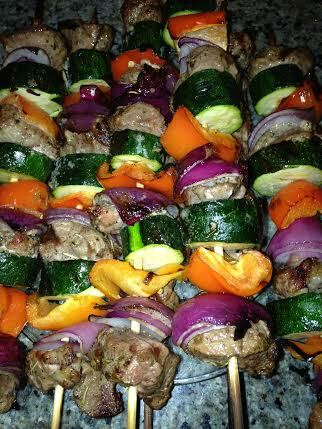 The shish kabob recipe is on the November 11 post but last night the entire dinner was so good I had to post all of it . It included farro cooked in chicken broth. The pasta zucchini is good left over. 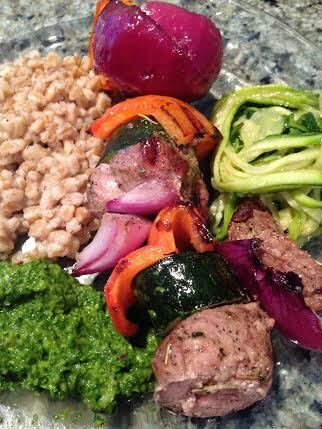 I think the chimichurri sauce pulled everything together. 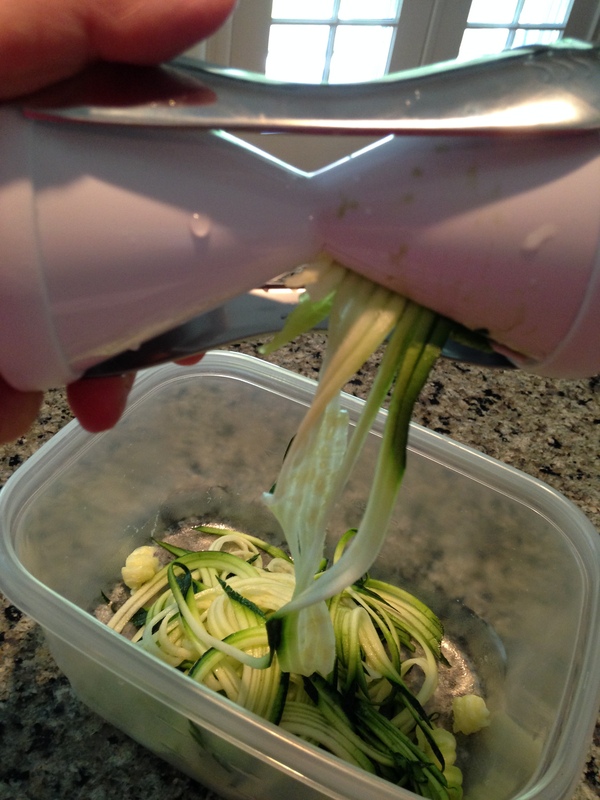 Place the garlic, salt and scallions in a food processor. Pulse until the garlic is really pureed . When everything is smooth, slowly add the oil threw the top of the processor. Taste to see if it needs more salt and thats it. Serve as a dipping sauce, salad dressing or as a condiment instead of mayo or mustard. I call this the Veggetti pasta because the tool I use is the Veggetti. My sister, Janet, gave it to me for my birthday and I have been Veggetting everything. You can buy it online or at Walmart. You can use the dressing of your choice. I used my lemon, garlic and honey dressing. You only use maybe five or six tablespoons of dressing. 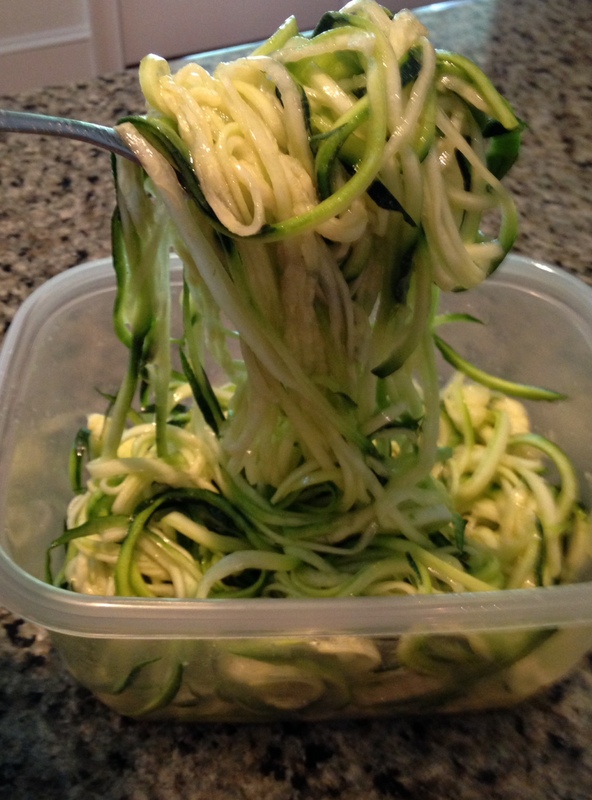 Put the squash in the Veggetti and twirl away. Put in a bowl and add your dressing. This is so good and fast. Today I am going to make a carrot slaw with raisens. walnuts, celery and just a little mayo. Tomorrow I will cook the squash and add a marinara sauce. I feel so healthy already. This is a salad I threw together and my kids loved it. Put the garlic and salt in the blender. Add everything else and blend till everything is combined. Taste to see if it needs more seasoning. Mix all the salad ingredients and then lightly dress the salad. It is a delicious refreshing salad with the lime and cilantro flavor. I served this with a coconut crusted cod and roasted sweet potatoes. I had a fabulous lunch with my son at the Matunuck Oyster Bar and they have a cucumber oyster appetizer. It is delicious. I had to try to copy the recipe. I didn’t want to shuck oysters so I decided to use shrimp. One two pound bag of uncooked peeled and deveined 16 to 20 count shrimp. One English cucumber cut into 1/4 inch slices. Do not peel the cucumber. Wash the shrimp and pat it dry. Mix the flour, salt, pepper and old bay together in a plastic bag. Add the shrimp and shake till all the shrimp is lightly coated. Heat the butter and oil in a nonstick skillet over medium high heat. Add the shrimp in batches into the hot skillet. Cook till one side is crispy brown then turn and brown the other side. This takes about two minutes per side. Watch them so they don’t overcook and then force yourself to taste one to see if it is done. In the meantime, slice up the cucumbers and put them on a tray over the big handful of arugula. Mix the mayonnaise and sriracha sauce together and put a thin layer on top of each cucumber. Place the shrimp on top of that and another small dollop of mayonnaise mixture. Drizzle with lemon juice and decorate with the remaining wedges. 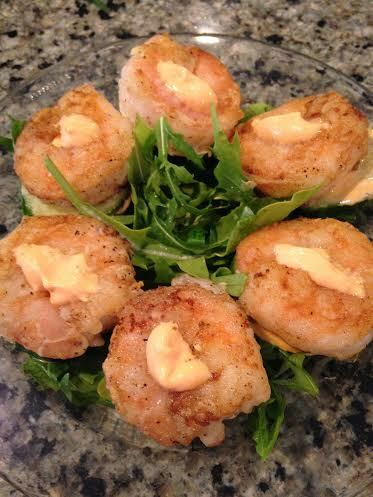 Put a couple of arugula leaves on top of the shrimp and enjoy. These are so good and so easy. You can also use cornstarch instead of flour to coat the shrimp. Just a little wedge of avocado would be delicious. I also like fresh dill for garnish and taste but I didn’t have any. This is a great lunch, dinner or appetizer. This is a recipe that is so easy. Put everything in a large marinating container. 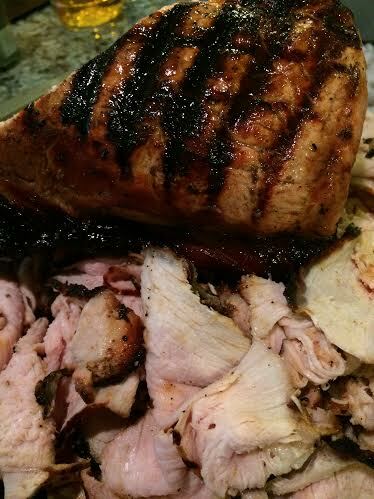 Take out of the marinade and place on a hot grill and sear all the sides. Place on indirect heat and continue cooking till the meat thermometer say pork medium well. Your oven meat thermometer can be used for the grill meat. Let the roast rest for a while then slice as thin as you can or use an electric slicer. I love my slicer. Treat yourself and buy one. I slice the entire roast and have a huge platter of thin sliced meat. Before I clean the slicer I slice some onions and apples paper thin and serve with the pork. Sometimes I boil the marinade very well and use it as a dipping sauce. Most people say not to do this but I do.